It was the coral shade that spoke to me. For this design I needed a second color and the cream is a perfect companion shade. It's not a secret that I like knitting with fine yarn and small needles, but this time I may have gone too far. The sweater calls for laceweight yarn and this Debbie Bliss Rialto Lace should work perfectly. The coral is shade #26 and the cream is #01. I set the unfinished afghan squares and the Mosaic pullover aside and jumped in to the new project. According to the pattern you're to cast on with US #6/4.00 mm needles and you should choose a size that gives you up to 10 inches of positive ease. I thought, with this shape, it wouldn't matter if the sweater was a bit bigger or smaller, it would all be good. I could adjust the needles, if needed, for the sleeves...but the body would be fine. So, I didn't swatch. I have always swatched for sweaters, but noooo, not this time. The design is worked from the neck down and I cast on my stitches using the provisional cast on technique. The method is to work part of the back, then pick up the live stitches from the cast on and work the front, giving the sweater a seamless shoulder. The yarn is very fine and the needles rather large in comparison. The result was a loose, open fabric....too loose and too open, and my gauge was off by quite a bit. I wouldn't wear a sweater with the stitches as open as that. Rip, rip, rip. Before starting again, I caved in and did a gauge swatch on size #4/3.5 mm. The swatched piece was still very light and somewhat loose, but quite nice and airy. It'll be nice lightweight sweater, perfect for summer evenings. The feel of the yarn is wonderful. It's extra fine merino superwash. This evening, I cast on with the smaller needles and have worked 10 rows. So, I'm off and knitting. It may take a while to make an oversized pullover with laceweight yarn. I may have lost my marbles in taking on this project. Time will tell. 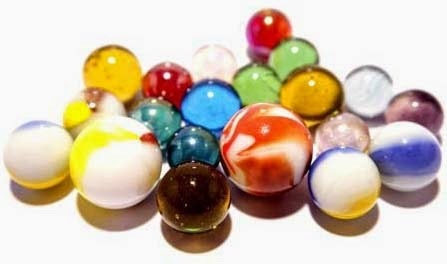 Where are the rest of my marbles? I seem to have lost some! Isabell Kraemer's designs are very popular, which you can see if you browse her creations on Ravelry. At just about the same time that I started my Hint of Sweater pullover, I found that a friend had completed her Ravello. Of course I had to add that beautiful design to my Ravelry queue but I'll resist starting it for a little while at least. Really.